Christopher Knowles’s work impresses me in how it is highly formal, but also fully engaged with the material qualities of the media and technologies he uses. I am also pleased with, and feel affinity for, how his “typings,” even when seen in the traditions of concrete and visual poetry and typewriter art, cannot be easily classified or contained within either visual art or poetry. 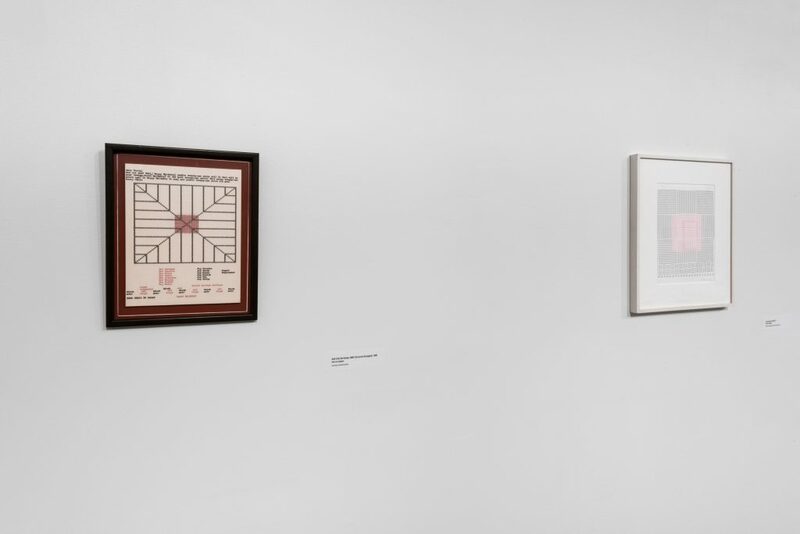 Christopher Knowles: In a Word, September 16 – December 27, 2016, installation view, Institute of Contemporary Art, University of Pennsylvania. Photo: Constance Mensh. 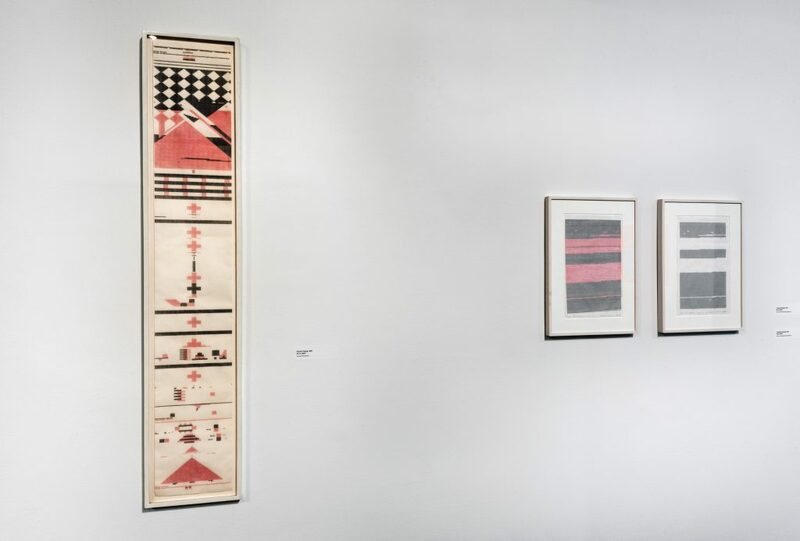 In some of his work, Knowles makes us of a typewriter, a now-antiquated writing technology he began to use when he was young and which he still employs. When I was young, I learned to program on several computers, including a Commodore 64. These technologies, early home computers, place letters in a typewriter-like grid. I still use the Commodore 64 to make art and poetry. 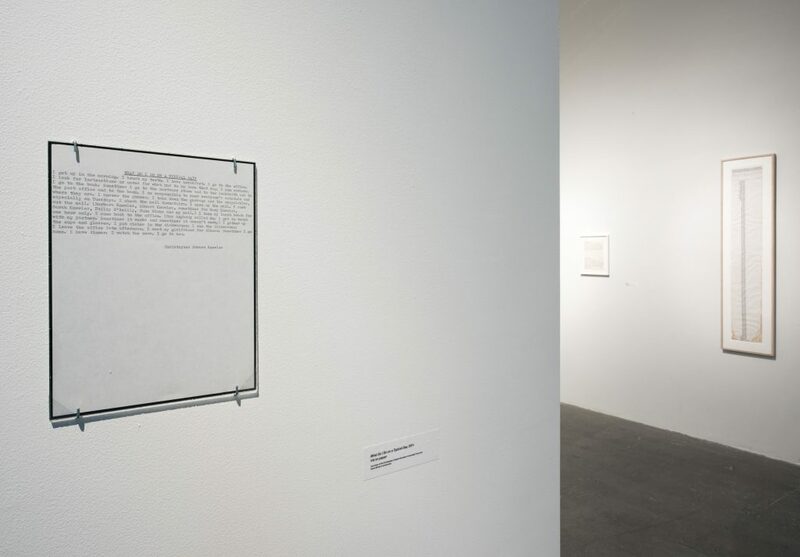 Knowles’s typewriters works evoke the performance of typing, serving as a trace of how they were inscribed on the page. In developing them, Knowles attends carefully to the dimensions of the page, using the factors of eighty-four (the number of characters that will just fit, plus one) to determine regions within which elements can be placed regularly across the page. For instance, in Dance, he repeats the five-letter word fourteen times, a space between each pair, to fill the page: (6×14 = 84). The result is a visual work, a trace of performance, and also a sort of sonnet. At the same time, there are sometimes signs of where the material reality does not perfectly match the formal framework. For instance, in C (squares), the page was inserted at a slight angle and, as a result, the type that is needed to complete the lower-left large square of text cannot completely fit on the page. At the very bottom the last two rows of type, and the elements made from that type, peel away from their larger rectilinear cousins above them. Adjustments were made; the program of the piece continued. 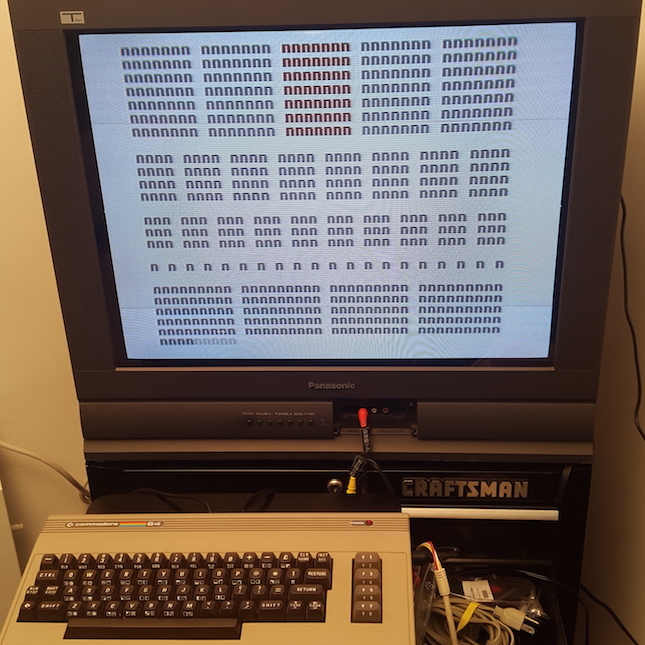 Program running on a Commodore 64. Courtesy Nick Montfort. I have created several Commodore 64 works that are based on visual artworks, some of which were seen in the exhibit Programs at an Exhibition at the Boston Cyberarts Gallery. I have also developed several Commodore 64 works that are based on the work of contemporary poets I know. In n (squares), I made a work based on C (squares). It is not a direct attempt to perfectly recreate the visual image of Knowles’s page. My piece for the Commodore 64, the BASIC programming language, and the writing technology of those platforms. n (squares) is simpler in some ways that C (squares), but it also runs continually to produce a different screen image at each step. I invite viewers/readers to interrupt the program (with ESC in an emulator, or RUN/STOP on a Commodore 64) and list the code by typing list and pressing Return. When listed in this way, the program itself fits exactly on a single Commodore 64 screen, just as C (squares) is fitted to the page. (RUN followed by Return will restart the program.) Those who look closely and study the program may find the place where I needed to deviate from what would be formally ideal to accommodate the material way the text actually scrolls. Nick Montfort’s books, Exploratory Programming for the Arts and Humanities and 2×6, a collaboration, are forthcoming in March. He is on the faculty at MIT and offers more than fifty digital projects at nickm.com. Funding for NOTES has been provided by the Christian R. and Mary F. Lindback Foundation.